Acting President Yemi Osinbajo has admonished Nigerians to always stand by the truth in their daily lives in order to honour God and secure His intervention. 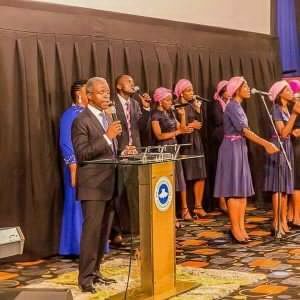 Osinbajo gave the charge in a sermon he delivered on Sunday to the congregation at the Redeemed Christian Church of God (RCCG), Jesus House, Silverbird Entertainment Centre, Central Area, Abuja. In the sermon, titled “The Image of Gold’’, the acting president said that a decision to stand by the truth always entail a level of discomfort or even outright persecution, but that God will always show up to justify the righteous. Taking his text from the Book of Daniel Chapter 3 verses 1 to 29, Osinbajp, a pastor of the RCCG, recalled the story of Shedrach, Meshach and Abednego who refused to bow to the golden image of the idol as ordered by Nebuchadnezzar, the then King of the global empire of Babylon. He said the three Jewish young men, who were then being held in captivity in Babylon, refused to bow to that golden image as a result of which they were hauled into the pit of fire. Osinbajo said that the captives survived the fiery fire because the Living God was with them in the fire, adding that God honoured His word in their situation as He promised in the Book of Isaiah 43: 2. “When God showed up in the fire through His Son, it was the first direct appearance of God in the Old Testament. If they had chosen to bow to the golden image and thereafter seek to make amends through prayer and fasting, it would not have helped them. “It is when you are passing through fire that you make a choice for God to honour Him. God said He will show up then,’’ the acting president said. Osinbajo said that in every circumstance of life, people, especially Christians, must stand up to what is right and just. “God is asking us to stand and stand up for something, be it against corruption, dishonesty, stealing or fraud in our offices etc. If we do not, we are bowing to that image of gold. We should stand for what we believe in as the three Jews did. “Every time we look at the scripture, God is saying: `Stand for something. You cannot afford to stand for nothing. Stand for Christ. The choice that faced the three Jews is still before us today. We face it everyday and we must stand for Christ, especially Christians. “Are you going to bow to the image of gold or take a chance with God and expect Him to show up? If you stand for Him, He will surely show up. God wants us to trust Him and to believe Him. “Are you going to bow to the image of gold or trust God to show up when you are thrown to the fiery fire? There are certain things that honouring God can do which fasting and praying cannot do. “Praying and fasting is good but it is better to Honour God in all that we do to provoke His intervention in our situations. “The image of Nebuchadnezzar is alive and well today – it exists. That image of gold stand before us everyday and everywhere. We must choose God. “Nebuchadnezzar’s Babylon had represented the system of the world, the corrupt system of the world governed by the devil. “Nebuchadnezzar was the king of that world system representing Lucifer, the Satan. So Nebuchadnezzar is saying to the people of all nations that Satan rules there. So you have to choose whether to serve the living God or bow to the image of the devil. “You must choose God. That is a decision which you and I make face everyday,’’ Osinbajo declared. Earlier, the acting president was ushered to the altar by the Parish Pastor of the Church, Pastor Pat Akem. Gov. Rochas Okorocha of Imo accompanied the acting president to the church service.